Obituary – Shea, Lawrence « Perry High School Alumni Association, Inc.
Sgt. Lawrence Shea was killed in action in Italy February 18, 1944, according to a telegram from the war department received by his parents, Mr. and Mrs. William Shea, 901 Locust, Sunday afternoon. Sgt. Shea has been fighting in Italy with the Perry battery C of the 158th field artillery, 45th division. He was mobilized with the national guards in September 1940, having been a member of the battery six years before it was called into federal service. Sgt. Shea is the second member of Battery C of the 158th Field Artillery, Perry’s own battery, to die in action. Pvt. 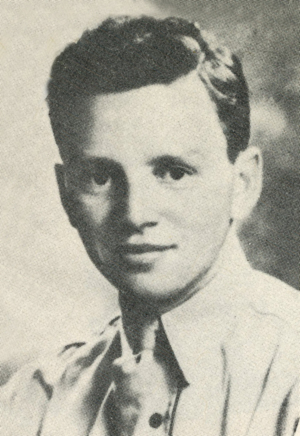 Lucian J. Hicks was killed in action February 12. No details of Shea’s death have been received by his family. The battery has been involved in bitter action on the Anzio beachhead for six weeks and it is presumed Sgt. Shea met death there. Sergeant Shea was married to Miss Jean Combrink, daughter of Mr. and Mrs. Fred Combrink of Billings at Tulsa in October, 1942. Mrs. Shea is deputy county treasurer. Prior to his call to active duty he was employed in the Illinois oil fields. Sergeant Shea was born at Sumner June 12, 1917. The Shea family moved to Perry in 1919, and Sergeant Shea attended his first eight years of schoolsing at St. Josept’s academy here. He attended four years at Perry high school and graduated in 1938 with a letter in basketball. Survivors, in addition to his wife, include his parents, Mr. and Mrs. William Shea, Perry; seven sisters, Mrs. Jack Webber, Perry; Mrs Pete Wiederkeher, Chickasha; Mrs. Lambert Casparis, Ponca City; Mrs. Harley Devilbiss, Cushing; Mrs. Garland Burton, Tulsa; Miss Daisy Shea, Perry, and one brother, John Shea, Ponca City. Sgt. Shea was a member of the Catholic church and requiem mass will be said for him at St. Rose of Lima church at 9:15 a.m. Wednesday by Father William H. Reid.